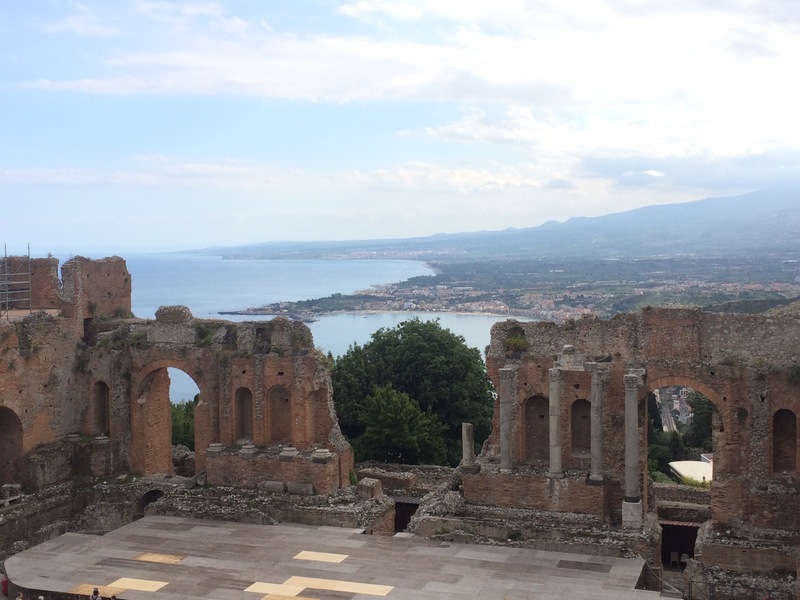 As you know, we hired a car for a few days so we thought we would make full use of it and go to Taormina on the east coast of Sicily not far from the Messina Straits. We had anchored there last September on our way down to Malta but the weather wasn’t great and we didn’t want to leave the boat. In fact, it would have been quite difficult to land the dinghy and get up to the town as it is set up high in the rocky cliff face – very reminiscent of Sorrento. By chance, friends of ours, Wanda and Catherine were also going to be there at the same time so it was good to catch up. We had found a lovely small hotel about 5 mins from the centre with its own parking for £50 per night so we decided to stay a couple of nights. We arrived late afternoon along with the rest of the world it seemed as the traffic jam to wind our way through the narrow streets was long. The view from the breakfast terrace was just lovely. We walked down to Wanda and Catherine’s hotel to meet them for a drink but got a bit lost so a 45 minute journey took an hour and a half! Still their hotel had a lovely view across to a little cove so it was worth it. The 6 of them including Dwayne, Simon, Neal and Clive, and the two of us got the cable car back up to the centre where we found a little trattoria off a side street and had fab freshly caught fish washed down with copious amounts of local wine. The evening was rounded off with the obligatory ice cream. 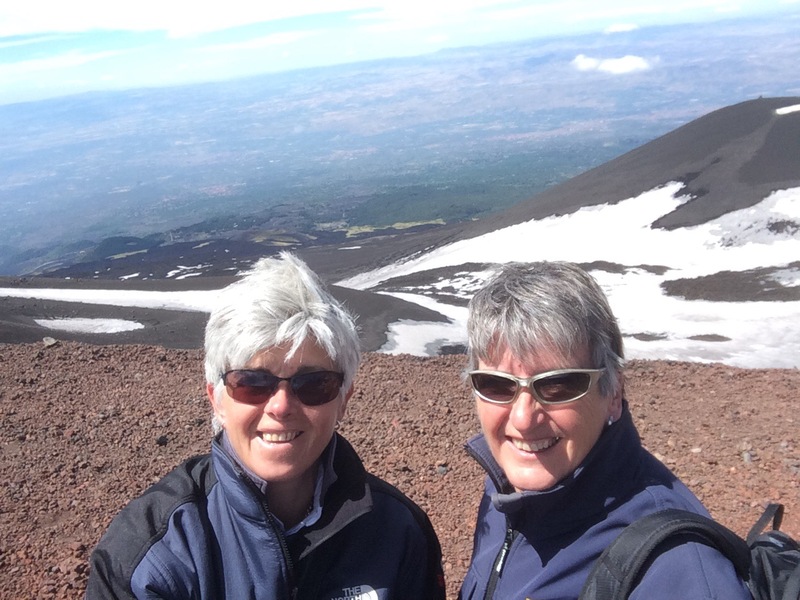 The next day (Saturday) the two of us drove up to Mount Etna. Whilst similar to Mount Versuvius the drive up was devoid of an litter. Indeed, Sicily generally is very clean and tidy – unlike the area around Naples! We arrived at the bottom of the cable car, some 1923m high to then go up a further 500m to be met by off road vehicles to take us closer to the crater. It was decidedly cooler at the top with a wind chill factor of at least 15-20 degrees so it felt closer to zero. 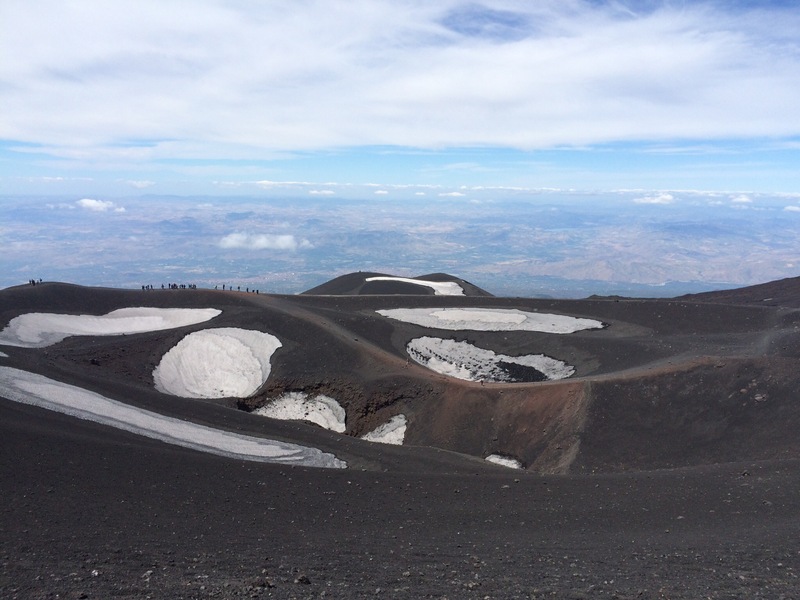 It was well worth the experience and cost as there was snow as well smoke coming from the crater. The souvenir shops were so tacky that even Liz didn’t want to browse! Mount Etna Mount Etna, complete with snow in May! We drove back along the coast road and went to Riposta to look at the marina for future reference. Very tidy and the town itself seemed very lively. 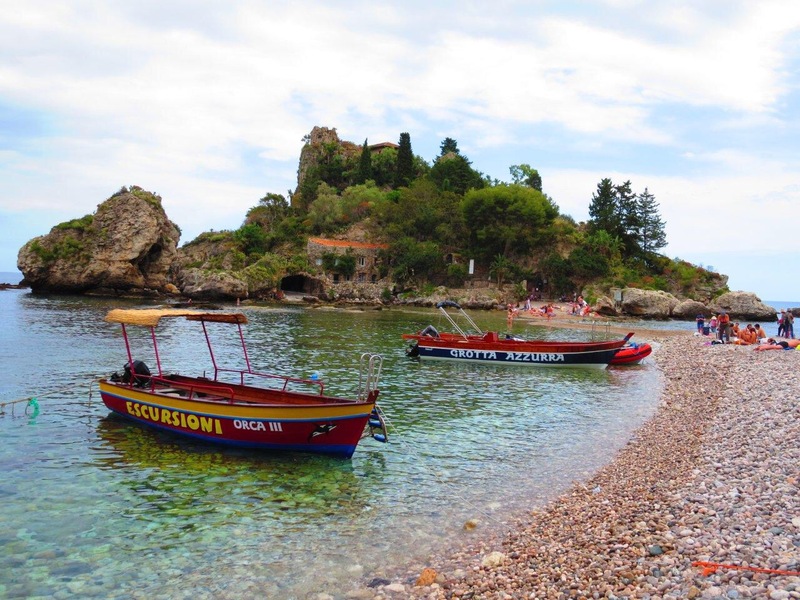 We also stopped at Isola Bella below Taormina where you can paddle across to the island. It was quite sweet but probably looked better from a distance. 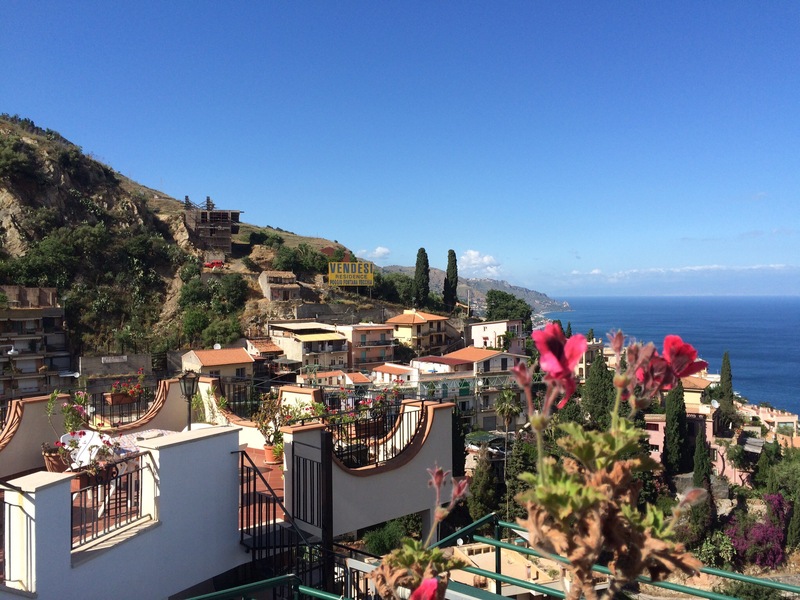 We decided to look around Taormina town before dinner in the top restaurant in Taormina, Cinque Archi. We visited the Greek Amphitheatre that is literally right in town and saw a lovely looking hotel with a fabulous veranda over looking the bay so, obviously, we had to have cocktails! All in all, a lovely place and somewhere we would go back to. Greek amphitheatre, Taormina Trying to decide which cocktail to have! 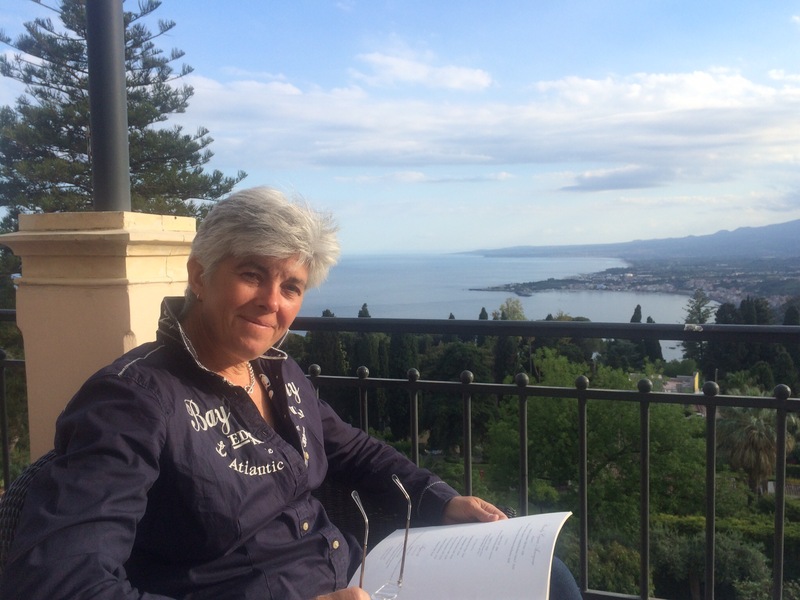 This entry was posted in News and tagged 2015, Greek, Italy, Med, Sicily. Bookmark the permalink.